The increasingly dynamic renewable power sector is enjoying “falling costs, increased investment, record-setting installation and new, innovative business models that are creating rapid change”, according to the REN21 Renewables 2018 Global Status Report (GSR), published this week. Solar PV emerges in the report as the “star performer for the second year in a row”, with newly installed capacity increasing by almost 100 GW over 2017, representing an astonishing increase of 33 percent over the record-setting additions of 2016. This brought the world’s PV capacity to just over 400 GW by the end of the year. Underlying the trend is the ever-falling cost of solar PV. A Mexican tender late in 2017 saw a world record low price below $20 per MWh, while a 150 MW project in Texas came in at $21 per MWh – the country’s lowest ever US solar power purchase agreement. Wind power remains well ahead of solar PV with some 540GW of installed capacity by the end of last year, but with a much slower growth rate – about 50 GW of wind power was added globally in 2017, an increase of nearly 11 percent over 2016. Canada, India, Mexico and Morocco all saw prices bid for onshore wind power come down to about $30 per MWh. Indeed offshore wind is now so cheap that tenders in Germany and the Netherlands in 2017 attracted zero-subsidy bids – that is, producers agreed to be paid market prices only for projects due to come online in 2024 and 2022, with governments providing grid connections and other support. “This would have been unthinkable even just a few years ago”, comment the authors. The heating, cooling and transport sectors, which together account for about 80 percent of global total final energy demand, are “lagging behind”. In heating and cooling, modern renewable energy supplies only about 10 percent of final energy use (while 16 percent still comes from traditional biomass). This is illustrated by the example of China, for example, which is “specifically encouraging the electrification of heating, manufacturing and transport in parts of the country where large renewable power capacity exists”. This means that when ‘variable renewable energy’ (VRE) from wind and solar is abundant, it can be diverted to these non-traditional uses rather than going to waste, so reducing the fossil fuel burn, and maintaining grid stability. 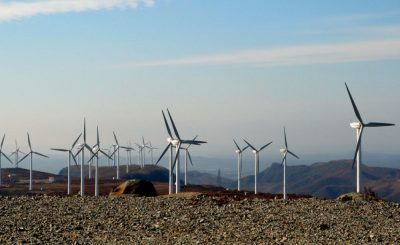 China has also emerged as the single dominant country for renewables investment generally, with 45 percent of the world’s total investment in the sector – excluding large hydropower over 50MW), up from 35 percent in 2016. By contrast the EU comes in with 15 percent and the US with 14 percent. Paradoxically, world investment in renewables grew only two percent from 2016-2017 (up from $274 bn to $280 bn) and remained well below the 2015 record of $323 bn – even as the technologies are becoming ever more competitive. And among ‘developed’ economies investment fell by 18.3 percent on average. Here the UK led the negative trend with a massive 65 percent cut, followed by Germany (35 percent), Japan (28 percent) and the US (six percent). In 2016, global fossil fuel production and consumption subsidies were estimated to total some $370 billion, only a 15 percent reduction since 2015″, states the GSR. “And while renewables continue to be perceived as ‘too expensive’ in some quarters, subsidies for fossil fuels were nearly double the estimated subsidies for renewable power generation”, at $140 billion. But these figures suggest a solution. According to the IEA’s World Energy Outlook 2017 (‘Sustainable Development Scenario’), keeping global temperature rise well below 2C in accord with the Paris Agreement would require a $12 trillion investment in renewable power supply from now to 2040. This implies investments of around $500 billion per year, compared to the $280 billion recorded in 2017. Switch the $140 billion fossil fuel subsidy to renewables and the figure would rise to $420 billion. Factor in the additional private investment into renewables that would follow and … problem solved. “To make the energy transition happen there needs to be political leadership by governments – for example by ending subsidies for fossil fuels and nuclear, investing in the necessary infrastructure, and establishing hard targets and policy for heating, cooling and transport.